Looking back to 100 years ago, a gallon of milk or gasoline would cost 12 cents, Woodrow Wilson was president of the United States, and World War I had just begun. That was the world Frances DiLodovico was born into on Aug. 12, 1914. 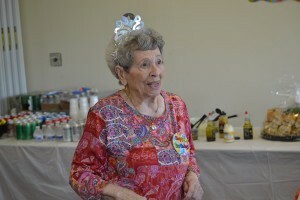 Now, 100 years later, DiLodovico was honored with a birthday celebration on Aug. 7 at the Gibson House Community Center. Surrounded by family, friends, fellow members of the Marlton Senior Citizens Club and township officials, dozens wished DiLodovico a happy birthday and many more. DiLodovico said she was shocked and surprised with the scope of the event and how many people came out to celebrate. DiLodovico was born on Aug. 12, 1914, in Philadelphia. The eldest of four children, her family moved to a farm in Atco when she was young. In 1939, she married Louis DiLodovico, and together they had one daughter. In the 1950s, the couple moved to Wildwood, where DiLodovico remained married to her husband for a total of 62 years until he passed away in 2001. That same year, she moved to Evesham to live with her daughter, where she resides to this day. When not spending time with her daughter or two grandsons and three great grandsons, DiLodovico can usually be found doing crossword puzzles, reading books and enjoying activities with the senior club. Asked for tips on living such a long healthy life, DiLodovico recalls her days growing up on a farm, and said she tells people to eat regular food and stay away from junk foods. At the event to present DiLodovico with a proclamation from Evesham Township was Deputy Mayor Ken D’Andrea. The proclamation congratulated DiLodovico on her longevity and personal accomplishments from the past 100 years, and D’Andrea said with everything DiLodovico had done and seen, she truly was part of the greatest generation. He was also impressed with her energy and thought she might have more than even himself. 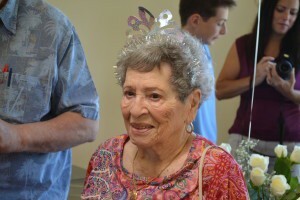 Irene LaProcido, DiLodovico’s daughter, said the event was wonderful, and thanked the senior club for organizing the celebration. She described the club as a nice group of people who really care about her mother and know how to have a good time, and it is membership in the club that gives her mother so much energy. DiLodovico said she likes to stay active, as she feels she has lived her life, and so no one else, especially her daughter, should have to be responsible and worry about her.